What's Going on at the Vatican? News emanating from the Vatican caught my attention this week. In an interview with Vatican Insider, Argentinean Bishop Marcelo Sanchez Sorondo -- the chancellor of the Vatican's Pontifical Academy of Science -- proclaimed the People's Republic of China as the country which is "implementing Catholic social teaching best." No, that isn't a headline from The Onion. And there's more. Sanchez described China as "extraordinary," and his fulsome praise for the communist country was set in stark contrast to his view of the United States. "The economy does not dominate politics, as happens in the United States," he said. "You do not have shantytowns, you do not have drugs." Chinese youth do not use drugs, according to Sanchez, because of a "positive national conscience." (A recent article in the Huffington Post about China's harsh crackdown on widespread illegal drug use reveals this to be a complete falsehood.) Sanchez also praised China for its "moral leadership" on the environment, saying that they were implementing Pope Francis' encyclical Laudato Si' better than many other countries (including and especially the U.S.), and is actually working toward "the greater good of the planet." It is impossible to reconcile such glowing reviews of China with its history of forced abortions (numbering into the millions each year), infanticide -- particularly of female babies -- and mandatory sterilization, all resulting from China's "one child policy." How does any of that square with the teachings of the Catholic Church on the sanctity of human life? Nor is this the only news suggesting that the Vatican is making uncomfortable compromises to get on China's good side. The Vatican is eager to restore diplomatic relations with China. To that end, the Vatican has entered into an agreement with the Chinese government whereby it has asked two "underground" Chinese Catholic bishops -- previously officially recognized by the Vatican -- to step aside in favor of two which are appointed by the Chinese government. Cardinal Joseph Zen, former bishop of Hong Kong, published a scathing open letter to the Vatican in which he accuses the Vatican of "selling out" Chinese Catholics to the communist government of China. Zen scoffs at the notion that there can be good relations between the Catholic Church and China's "totalitarian regime," asking, "Can you imagine an agreement between St. Joseph and King Herod?" Is secular humanism and socialist public policy infecting the highest levels of the Catholic Church, and weakening its commitment to human life? Other actions taken by Pope Francis raise even more concerns. In August 2016, Pope Francis appointed Archbishop Vincenzo Paglia as president of the Vatican's Pontifical Academy for Life. Paglia immediately wrote new rules that removed all 172 existing members of the Academy, and eliminated the former requirement that all members of the Academy sign a statement promising to defend the Church's official position on the sanctity of human life. 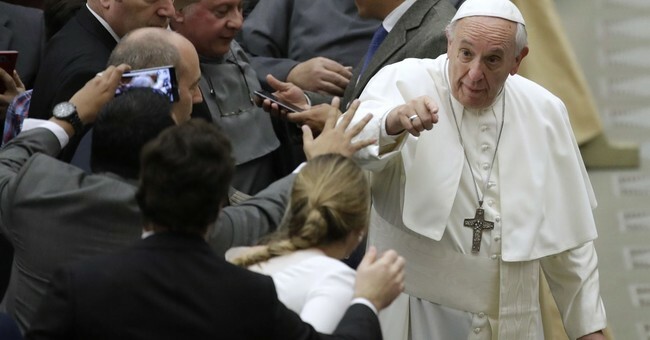 In June of last year, Pope Francis named 45 new members to the Academy, including Oxford University professor Nigel Biggar, who has both defended abortion and -- albeit in limited circumstances -- euthanasia. Former members of the Academy and other pro-life activists around the world have criticized the new configuration of the Pontifical Academy for Life as completely inconsistent with the purpose of its founding by St. John Paul II. And then there is Pope Francis' apostolic exhortation Amoris Laetitia, which many clergy and lay scholars alike have criticized as weakening the Church's positions on marriage, divorce and remarriage. The debate about the implications of that document continue to reverberate through the Church. While some of Pope Francis' statements -- such as his many criticisms of free market economics and capitalism -- have been charitably chalked up to ignorance, it is harder to make that claim in matters of the Church's magisterium on human sexuality and human life. Does this pope intend to dilute the official teachings of the Catholic Church to make them more palatable to the secular world? Will he take the Church down the same path that so many of the dwindling mainline Protestant denominations have gone? Devout Catholics -- and others -- who want to believe that a pope can never lead the faithful into doctrinal error are struggling to justify these events as anomalies or outliers. But each successive statement and official act makes that increasingly difficult. At some point, one must conclude that what is happening is deliberate, not inadvertent; intended to be the rule, not the exception. When Christ appointed Peter as the first head of the Church, Christ said that "the gates of Hell shall not prevail against it." I believe that to be true. But that doesn't mean they won't put up a damn good fight.